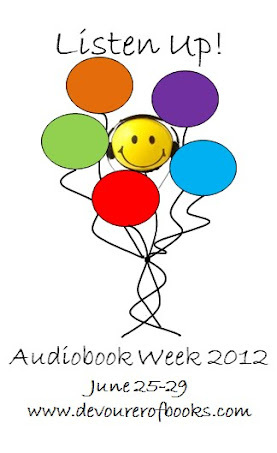 Mid-Week Audiobook Meme – my books. my life. Impressions: It’s still early. I’m waiting for things to happen. But the narration is good – and familiar since I just read The Art of Fielding. Your audio dream team (what book or author would you LOVE to see paired with a certain narrator, can already exist or not): I’m not really sure, so I’m going to suggest one for Jennifer over at The Literate Housewife. Let’s unite the Simons shall we? Simon Vance reading Simon van Booy? I’m not sure Simon Vance reading Simon van Booy should be allowed, that might just give Jennifer a heart attack. I think you’re right! She might not make it out of that alive. Too much “Simon” may just be TOO much. (LOL at Jen’s comment!) Have to agree with you on Ready Player One, in fact I think it was your review that pushed me to listen to it. I also adore all of Joshilyn Jackson’s audios as well. I read A Land More Kind Than Home in print, but now I really wish I’d listened. Everyone seems to love it. I’m laughing at Jen’s comment, too! Have just added The Invisible Ones to my wish list. Just laughing…. its early. Good post! YAY to Ready Player One! Sounds like I must try Dan Stevens. Jennifer wouldn’t know what to do with herself if that happened!! omg, the 2 Simons together? wow!! maybe put me also on the list of heart attacks though! Ready Player One is on my TBL – funny basically all the posts I have read so far for this meme mention it, one way or another. I have seen Ready Player One on everyone’s blog and so I am adding it to my TBL list. I think it might be my next one. What a gift! I can’t believe I didn’t come up with it myself. I guess sometimes you need other people to imagine your nirvana for you. 🙂 Thank you so much! Thanks also for being the first of the myriad of Audiobook Week bloggers to push Ready Player One at me. What in the name of God did I wait so long for? Loving it! Canada sounds really good, plus I always like Holter Graham. Maybe it should be for a zombie book then. Although Simon Van Booy writing a zombie book itself might be a sign of the apocalypse. We have similar answers today! I’ve got to get Ready Player One on audio. Pingback: TSS: June 2012 Recap | my books. my life.